So, yesterday there was an announcement that Michelle Gomez would be reprising her role as Missy (AKA The gender switched Master) in the upcoming series of Doctor Who. Now, do not get me wrong I am in a way pleased by this announcement as I did enjoy seeing the Master reimagined as a woman and I think it is good to get the character back. However, I have one very huge misgiving about it… the character has really been killed far too many times now. Then at some point he finally did get given the new regeneration cycle because of his promises to help during the Time War and that leads us to Uptopia and the wonderful portrayal by Derek Jocobi who I would have liked to have seen more of before his regeneration to John Simms but the fact he did regenerate shows he had been paid in full by the Time Lords before legging it all the way to the end of the universe and activating his Chameleon arch. So far so good. John Simm was a good Master and managed to give across the right level of insane evil coupled with that empathic bond with Tennant’s Doctor which rightly portrayed the Xavier/Magneto relationship inherent in their associations – two people who were as close as brothers driven apart by wildly different ideologies. Then Simm’s Master died. Not in a ‘it’s ok, I will regenerate’ way and merely be played by yet another actor but in a ‘no, there is no way I will regenerate’ way. Then he came back… in a way that was a little unrealistic and far fetched even for Who. Then he died again… this time also in a way that seemed to preclude regeneration. Finally, at the end of the last series, she is also killed and again regeneration seems unlikely… yet here she is, back and ready for more. Now, to be fair, that last death may be more than it appears. I am willing to accept that since that episode’s final moments were all about lies (the Doctor’s lies to Clara about Gallifrey, her lies to him about being happy) its possible that her death was an elaborate illusion and she was merely teleported somewhere else with the appearance of being totally vaporised. It’s a trick used before in Who (the Big Brother episode in the Ecclestone series, for example) so I am willing to accept it is possible. However, it does not detract from the fundamental issue. Death should not be cheap. Killing a character should have an emotional impact. Equally so should bringing them back from death. Having grown to love or hate them over the course of your reading or viewing of them, to have that character suddenly be taken from you should be a vicious and painful experience. As a reader or viewer you should feel that pain. However, the more you kill them and the more you bring them back the more you stretch the suspension of belief and the more you dilute the emotional impact. 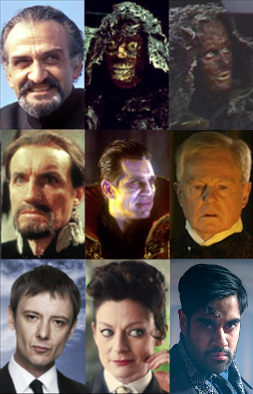 Recurring villains are great, a much loved staple of fantasy and SF and even less fantasy based stories such as the Three Musketeers, and used right they can be wonderful creations. However you can push it too far and using the ‘they’re finally dead for good and this time we mean it. Oh no, we totally didn’t mean it’ card too many times (or more than once, really) is not good storytelling. If you have a popular character who you think may be worth a reappearance it is better planning to not kill them off. Have them escape from being captured (the Master has done this a few times too) or simply slip out the back door while the heroes are battling the convenient distraction they arranged for them. This applies doubly to Time Lord enemies. After all, you already have a convenient and perfectly plausible method for them to come back from the dead (regeneration). Why have to go to all the effort of making up some new ways to bring them back after managing to eliminate that as an option? Fans would rather the enemy were still alive – so they and the heroes know they are still a threat – or able to come back in a way which does not seem too ridiculous and fits in with previous observed metaphysics of the way the universe works. OK, yeah, in some universes (Marvel and DC I’m looking at you) the afterlife has a revolving door and characters pop in for a brief break between adventures only to pop back when sales of the comic drop. And let us not forget poor old Kenny in South Park. However, in most fictional universes, it is better to stick to a more realistic means of death in order to keep the audience with you. Less South Park, more Game of Thrones, make every death meaningful not a cheap joke or marketing ploy. *Which incidentally also set up the canon that they can do that leaving the way clear for Moffat to have it happen to Matt Smith’s Doctor.